Habitual liars' brains differ from those of honest people, a study says. A University of Southern California team studied 49 people and found those known to be pathological liars had up to 26% more white matter than others. But the British Journal of Psychiatry said there were likely to be more differences in the brains of liars. Participants were volunteers drawn from five temporary employment agencies in Los Angeles. Three separate groups were studied. The first consisted of 12 men and women with a history of being pathological liars; the second was 21 people who did not have a history of lying or anti-social behaviour. The third group consisted of 16 people with anti-social personality disorder but no history of pathological lying. They were studied to see if they showed the same brain make-up as liars. The researchers drew up a list of criteria for lying, cheating and deceiving, including habits such as conning people or behaving manipulatively, and telling lies in order to obtain sickness benefits. They also assessed how much grey and white matter people had in the prefrontal cortex areas of their brains, using structural magnetic resonance imaging (MRI). Liars were found to have between 22 and 26% more white matter than either those with no history of lying or those in the anti-social group. The findings could not be explained by differences in age, ethnicity, IQ, head injury or substance misuse. This is the first study to show a brain difference in people who lie, cheat and manipulate others, the researchers said. They said the study could help research into areas such as people who feign illness. The findings are in line with previous studies which showed children with autism are less capable of lying than other children. Brain neurodevelopmental studies of autism show people with the condition have more grey matter than white matter - the opposite pattern to the liars in this study. The researchers say the link between white matter and a deceitful personality could be that white matter provides a person with the cognitive capacity to lie. Writing in the British Journal of Psychiatry, the research team led by Dr Yaling Yang, say: "To our knowledge, this is the first study to show a brain abnormality in people who lie, cheat and manipulate others. "The results further implicate the prefrontal cortex as an important - but not sole - component in the neural circuitry underlying lying, and provide an initial neurological correlate of a deceitful personality." They add: "Further studies are required to examine changes in brain anatomy during the critical neurodevelopmental period in childhood, alongside changes in lying ability, to test further our preliminary hypothesis on the link between prefrontal white matter and lying." Dr Cosmo Hallstrom, a consultant psychiatrist in London, said: "The issue is always how much of our behaviour is under voluntary control and how much is innate. "The finding of brain abnormalities lends weight to the idea that a strong component of such difficulties may well be beyond voluntary control at least in part." 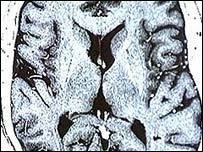 Can brain scans detect criminals?